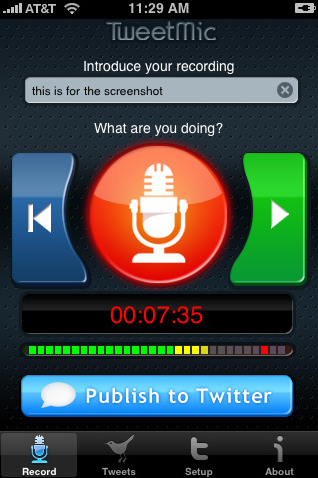 Tweet Mic iPhone App Review. Combining Twitter and the iPhone has to be in the highlights of the day, but with Tweet Mic, the simple Twitter client app for the iPhone, you're bound to have your own spotlight. The app lets you create audio tweets and publish them directly to your Twitter account online. There's nothing much to the app, in that it excels in simplicity while being extremely intuitive and effective. Benefiting from a clean and simple interface, leaving out the bells and whistles, Tweet Mic does a great job for what the development team meant it. All you have to do is push the big red button in the middle of the screen, start speaking your mind and push it again to stop recording. Nothing much to it, but there's no limit to how much you can record, and the service comes at no additional costs whatsoever. You can of course review your recordings before sending them to that big Tweetcast cloud up in the sky. Sound quality is pretty good although I can't seem to recognize my voice on tape for some reason. Is it just me?! You can view your tweets thus far in a very basic layout, but keep in mind this app's goal is not to replace Twitter but to enhance its possibilities. One thing we'd like to see happening in the future is an enhancement for this app to translate voice-to-text. But as far as it goes right now, Tweet Mic is a pretty interesting app to have on your iPhone, and if you're one of those lazy types that would rather dictate than take notes, then publishing to your Twitter account will take you to a whole new level. The app is available for $0.99 in the App Store.